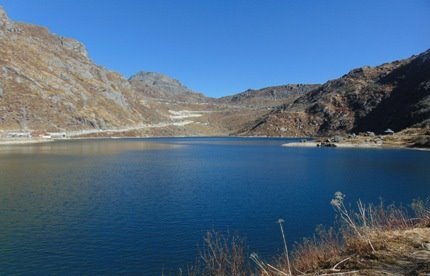 Tsomgo Lake, also known as Changu Lake is a glacial lake in Sikkim and located at an altitude of 12,310 feet. The name Tsomgo means 'Source of water'. It's located 40kms from Gangtok town and on the steep route known as Jawaharlal Nehru Road which leads all the way to Nathula Pass. This is one of the few and awesome high altitude lakes in India. The lake becomes doubly attractive with the reflections of the surrounding hills on the water. From Gangtok which is at 5410 ft, the altitude rises to about 10,000 ft in just 15kms. You can imagine how steep the gradient would be on this stretch of the road. Prior to 1962, this was part of the old trade route between India and China. Mules used to carry loads along this route. Some parts of the route below Karponang (which is 15kms away from Gangtok) used to be very treacherous and dangerous. Many mules would slip and die falling into the depths of the ravines below. But no longer so, proper road has been built, although condition of the road usually remains bad due to snowy & foul weather conditions. From Karponang the road is not as steep as the earlier stretch. 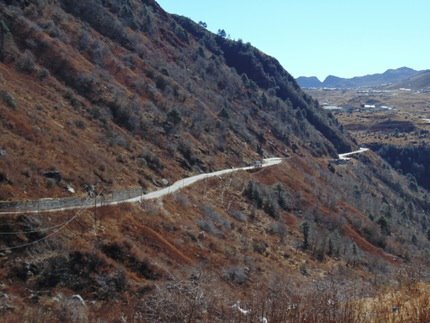 Another about 10kms further up you will reach Kyongnosla Alpine Sanctuary which is home to rare animals like Red Panda, Himalayan Black Bears and birds like Blood Pheasants. Usually you can only spot a few yaks though. You can find numerous types of medicinal plants here as well as rare Orchids and Rhododendrons. From here you get nice views of Gangtok town and the surrounding hills. The sanctuary covers an area of 31 sq. km and stretches all the way up to Tsomgo lake. Another 1km ahead and then a 5 minutes walk inside there is Tseten Tashi Cave with about 20-ft high ceiling inside. This cave was named after a naturalist who was also the private Secretary to the King of Sikkim. Finally you will reach Tsomgo lake. It takes about 2 hours by car from Gangtok to reach the lake. The lake is filled with water of melting snow coming from the surrounding mountains. It's a one kilometer long oval shaped lake. The average depth is about 50-feet. During summer and autumn, you will find Primula flowers and other Alpine vegetation around the lake. And during winter the lake becomes frozen and a snowfield. You can not litter the lake. Installation of prayer wheels and a small temple of Lord Shiva by the lakeside denotes that the lake is considered sacred by the locals. Tsomgo lake is a stop over place for many different migratory ducks like the Brahmini ducks. You should spend some time here and soak in the serene beauty of the lake and its surroundings. In the earlier days the lamas used to study the color of water in the lake and forecast the future. A darker color would indicate that the coming year in the state may be troublesome. There is a pathway along the lake that leads to a resting place - about half a kilometer walk. Only about 200 meters away from the lake there are lots of stalls & shops selling tea, coffee and snacks. You will get hot Tibetan noodle soup to combat the cold. Stalls rent out snow boots, jackets, gum boots etc. There are pay & use toilets inside the complex as well. However there is no lodging accommodation in this area to stay overnight. What more? You can take a ride on colorfully adorned yaks and ponies. One more terrific activity is being planned at Tsomgo. Foundation stone of a 957-meter ropeway (cable car) has already been laid here in 2010. Once implemented, the cable cars will carry passengers from the lake to a hilltop nearby. You should reach Tsomgo lake before noon because in the afternoon the weather here usually starts getting bad. In fact best is to start from Gangtok by 7:30 to 8am and reach here by 10am so that you get clear 2 hours to enjoy. In the winter however the route sometimes get closed due to heavy snowing. Photography is now permitted. You can either take a reserved vehicle or in high season join a group tour on a shared basis that operates on per person rate. Most tourists combine visit of Tsomgo lake with Baba Mandir which is few kms away. A reserved large vehicle like Sumo costs about Rs. 4,000 for a round trip to Tsomgo and Baba Mandir, the shared vehicle rate is about Rs 450 per person. If you start by 8am, you should be back by 3pm. So both Tsomgo and Baba Mandir are covered as part of a day trip from Gangtok. You can also additionally combine Nathula Pass (14,140 ft) and see the Indo Chinese border. A reserved vehicle like Sumo would cost around Rs. 6,500 and a shared vehicle around Rs. 900 - 1000 per person. Note that shared group tours usually operate in high season (i.e. April - June and October to November). You are unlikely to get a shared vehicle in off seasons. If you have breathing problems, you are advised to consult a doctor before visiting these places (particularly Nathula) because of low oxygen at such high altitudes. Portable oxygen cylinders are available at Medical shops in Gangtok. Hey, I am planning to visit Gangtok this June. I wanted to ask as to how long do shared vehicles usually stop at Tsomgo lake before moving to Nathula pass. Do they not stay for long? I want to have a yak ride and enjoy the surroundings of this place before moving on with my travels but a reserved taxi would be too expensive. What should I do? You can manage a short Yak ride at Tsomgo while visiting on a shared group tour... they usually stop for 40 - 45 minutes at each place. Will my 4 year old daughter be allowed for Tsomgo Lake and Nathula pass... Please reply... We are planning a trip in mid June. Kids below 5 years are not issued permits and often stopped at the check posts for proceeding to Tsomgo / Nathula. Dear Raj, Is it advisable to travel to Tsomgo lake, Baba mandir in December 21 with child of age 8 years for snowfall. I have heard about the problem of low level of oxygen and very low temperature there. Kindly advise me. It will be of great help. Thanks. Hello, children over 5 years are allowed in that route. However you need to take adequate winter precautions. Sometimes the route could be closed due to heavy snow. Me and my friend from UK are planning to visit Sikkim and someone told me that foreigners are not allowed to visit the lake ... please advise if this is true ? Is there anyway at all we are allowed? I appreciate your response. Foreigners are allowed to visit Changu (Tsomgo) lake with required permits. Hi Raj, thanks for such a detailed information. Best part is that you have provided month wise details. I am travelling to Gangtok & Pelling with my 1 year old daughter on 29th Sept till 3rd Oct. Please suggest, is it advisable to go to Changu lake with her. And what precautions do we need to take with her? Hi, it is not advisable to take an infant to such altitude... other than excessive cold, it can cause breathing problems. Hello Raj, Thank you for all your useful information, it's been great. Quick question: I know foreigners are required to get Sikkim ILP (permit) to travel into Sikkim. I also know that foreigners are not allowed at the Nathula pass and border, but can a foreigner do a day trip from Gangtok just to visit Tsomgo Lake and then return back to Gangtok? Thank you. Yes, with Protected Area Permit (in addition to ILP). Hi, it's a group tour to Changu lake on per person rate and not a point-to-point transfer by shared vehicle. So the same vehicle will get you back to Gangtok and complete the tour. Hi Raj, We are planning to travel to Gangtok in mid Nov. 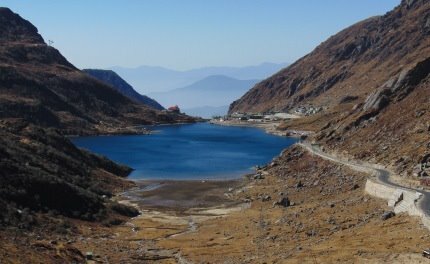 I heard of lack of oxygen in Nathula pass but what about Tsomgo lake and Baba mandir? Is it safe to take an infant along to visit Tsomgo lake and baba mandir considering low oxygen. Also I heard that taxi drivers keep ACs off when driving to Tsomgo lake. I heard of suffocation on the route to Tsomgo lake from fog and absence of AC. Is that right? Hi, high altitude problems from lack of oxygen is known to occur roughly from 8,000-ft onwards. Infants (above 3 months) are known to have similar tolerance as adults in such cases. And all these places (Tsomgo, Baba Mandir, Nathula) are well over 12,000 ft. So if you are concerned, you should definitely consult a doctor before visiting these places. About 25% of visitors do have breathing problems no matter what (but seldom serious). There are medicines known to retain body-oxygen and help in such situations. But most of those who have such problems do not acclimatize themselves in high altitude and rather get into high energy activities immediately. Taxis and private cab drivers would normally switch off their car ACs in the hills here because of high gradient. The gradient exerts high load on the engine. They also do so because of the myth that AC means only cooling and therefore why should one need cooling in overly cold mountains. Having said that, ACs can't maintain the oxygen level anyway. You can carry portable oxygen cylinders from Gangtok, if you want.